Suddenly warnings about the consequences of political violence feel out of date, and non-violent political action feels all the more urgent. Through 2010 I talked about the coming turmoil in our country. The title of the book I wrote that year, Revolution in the Air, stated the case well enough. Revolution is in the air. 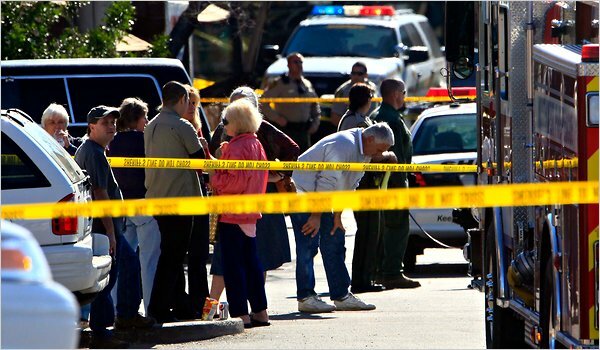 Now we have news that Jared Loughner shot eighteen people at a political gathering outside a Safeway in Tucson. Much as people might lean toward lone nut explanations for acts like this, we have to recognize political violence when it appears. Government officials in Washington seem to recognize this massacre as a political event. Arguments about non-violent resistance to authority and warnings about political violence are related. The key connection is this: change is coming, change born of anger, frustration, and a complete loss of trust. The government has made itself illegitimate in the eyes of enough people that it does not command the allegiance of a clear majority any longer. We have seen a pre-revolutionary situation develop since 2002. We are about to see whether it develops into a revolutionary one. People who understand where we are in this process know that our country has approached a key decision point. The government and people who no longer see it as a source of legitimate authority are going to see who has the greater strength. Critical in this contest is, which side will initiate violence, and which side will rely on force most readily to settle the conflict? If the government relies on violence to suppress peaceful resistance to it, it will become illegitimate for more and more people. If angry citizens rely on violence as their first weapon, their cause will become illegitimate. Remember Kent State: people condemned the government’s use of violence there, but people condemned students’ use of violence throughout the country even more. The students’ cause was right, but their actions elicited disgust. If the Vietnam war protesters had followed Martin Luther King’s example, they might have achieved the revolution they sought. King achieved the social revolution he sought because all the violence came from the other side. People in the south and the north became disgusted with Bull Connor. Stop the fire hoses, they said, keep the police dogs off the street. We don’t want to see any more blood. To achieve change, you have to disobey illegitimate authority. To achieve change that lasts, you cannot respond in kind when illegitimate authority uses violence and coercive force against you. Victory goes to the side that holds the high moral ground. If you give up your moral authority, you give up the fight. That’s what happened when the United States government used torture after 9/11. It gave up its moral authority around the world. It gave up its moral authority here in the United States as well. This principle of conflict holds: Victory goes to the side that holds the high moral ground. If you give up your moral authority, everything you do becomes a source of disgust. You have lost your ability to accomplish anything good. The news from Tucson brings tragedy for everyone. The people shot, their families and friends, feel it most acutely. As the significance of this crime sinks in, the rest of us will ask: have the forces of anger and frustration taken an irreversible step down the path of political violence? Can disciplined citizens hold onto moral authority in the ominous contest with a government that cares little for their liberties? No one can tell how much violence we have in store, but now we know who reached for deadly weapons first. If angry citizens turn their resistance onto a violent track, and it stays there, the results are predictable enough. The appearance of democratic governance will persist in our federal institutions, but in fact these institutions won’t govern democratically at all. The liberties that so many brave men and women fought to secure won’t survive if citizens initiate violence against people in public service. If on the other side citizens resist the government’s authority without violence, as King’s followers did, the government’s illegitimate authority will fail, and our liberties will live for another generation or more. Check out Steven’s most recent ebooks, Soldier of Fortune and Revolution in the Air, at Smashwords.